Our art gallery features quarterly art shows from local and regional artists. John Leo Baker was born in McKees Rocks, PA on March 27, 1927 to Theresa and Nicholas Baker. He was the seventh out of nine children. His family owned and operated The Seven Baker Brothers Bakeryin the West End of Pittsburgh. When John was twelve, his mother enrolled him in St. Joseph’s School of Practical and Fine Arts of East Liberty, Pittsburgh. On Saturdays, he traveled by trolley and bus to East Liberty from McKees Rocks. 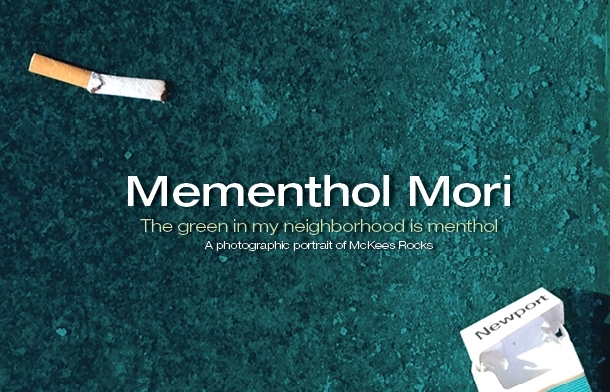 Through years of observation, its clear the green in my neighborhood is menthol. For a long time, I have been photographing the discarded Newport cigarette packs populating the streets. While those empty packs remain a memento of my former nicotine addiction, this project has evolved into a meditation on mortality, personal choices, a community's habit, and its effects on people like me. A born & bred Rocks girl, Angele Love, M.E.T., is an Associate Professor of Media Arts & Animation at the Art Institute of Pittsburgh. We are excited to host 3 great programs to celebrate African American History Month. A very special "Thank You" to Mr. Willie Dawson, for curating this fantastic project.